The history of G Prep. For many years, early education was a part of the Jesuit mission, and that tradition is alive today at Gonzaga Preparatory School — one of four Jesuit high schools in the Pacific Northwest. The student body that would ultimately be known as G-Prep was moved around, from small, basement classrooms to military barracks to, finally, its current campus on Euclid Avenue. 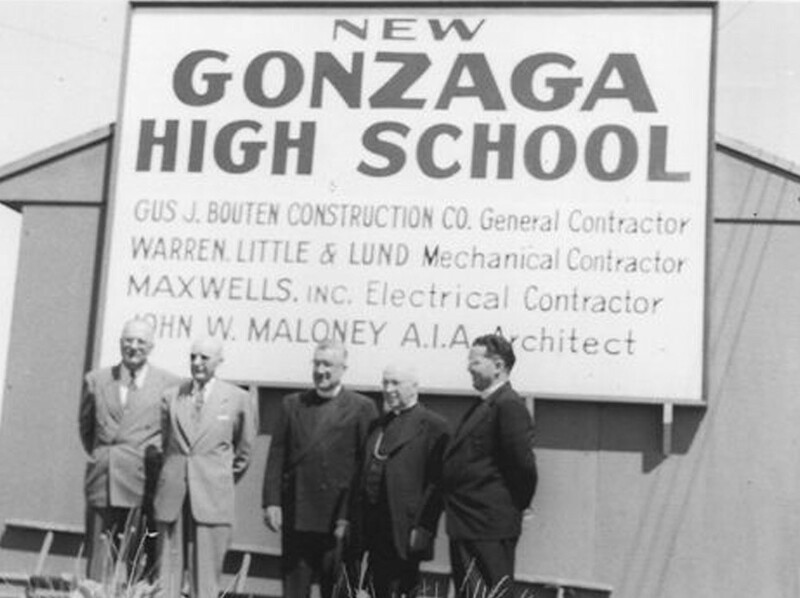 Although for many years Gonzaga High School was a department inside Gonzaga College, the two schools’ histories have always been intertwined. Gonzaga Prep also traces its start to 1887 and will celebrate its 125th anniversary next year. Through 1892, the high school was taught by a single layman, finding space where he could among the few buildings at Gonzaga College and moving often. When the Jesuit Scholasticate at the Saint Ignatius Mission of Montana relocated to Gonzaga’s campus in 1899, they took over the old Gonzaga College building (known as “The Sheds”), and Gonzaga College was moved into a new Administration Building (the center section of what is now College Hall). The high school students moved with the college. In 1916, 100 more Jesuits-in-training relocated to Gonzaga University. (Gonzaga took the “university” title in 1912 with the inclusion of a school of law.) This created another space crunch, but Saint Aloysius Grade School did relocate out of the university buildings then. The truth is, the university needed the enrollment generated by the high school. In the 1920-21 school year, for example, the entire university, including the school of law, enrolled only 144 students. The high school “department” registered 427 students that year. It took 39 years, but in 1926 the university finally released Gonzaga High to a separate administrative staff; it continued to occupy space on Gonzaga’s Boone Avenue campus, then moved just a block off campus. That arrangement continued until 1941, when the neighborhood’s public grade school, the Webster Grammar School, was declared expendable by the Spokane School Board. By acting quickly, Gonzaga High School operated in the newly leased facilities at the beginning of the new school year. Jesuits showed interest in purchasing the former elementary school in 1945 — for a rumored $40,000 — from the City of Spokane, but before anything could be committed to paper, a fire destroyed the structure. The high school reluctantly returned to quarters in Gonzaga’s Administration Building, a place suddenly overcrowded with masses of returning World War II veterans. The Army had constructed temporary buildings on the Gonzaga campus to train new recruits during the war — glorified tents, really. After the war, in 1947, the high school moved into those “barracks,” where 400 boys shared one drinking fountain. In 1948, Jesuit Father Gordon Toner became the principal of the high school. Encouraged by Bishop Charles White, Toner searched for an independent campus for the school. According to Father Wilfred P. Schoenberg, the preeminent historian of the Catholic Church in the Pacific Northwest, during the month of May, 1949, Father Toner persuaded a pilot to fly him over Spokane while he searched for suitably large parcels. Two pieces of property soon headed Toner’s list, but the one on Euclid Avenue, not far from the university, showed best when the principal walked the property. As a result, the Jesuits purchased the first two lots for the Gonzaga High School campus at public auction from Spokane County for $75 each, and to that they added an additional 83 lots, though at a considerably steeper price. During the next several years, a fund drive raised money for the project, and groundbreaking took place in 1953. A year later, in September 1954, the school opened to 610 boys following a solemn dedication. Legal incorporation papers filed with the State of Washington gave it the name Gonzaga Preparatory School, Inc.